After months spent attempting to unravel the US budget knot, Congressional hopes to reach a balanced budget balance were, once more, disappointed last month with the legislature’s failure to pass a budget and prevent sequestration. Funding of federal agencies will stop as of March 27, according to the spending bill approved on October 1, 2012. Governmental agencies like NASA will have a clearer view of the effects of intermediate budget cut measures on their programs in the next months, assuming absence of a financial year 2013 budget. Meanwhile, the House of Representatives Appropriations Committee on March 4 approved the Full-Year Continuing Appropriations Act of 2013 (H.R. 933), whose aim is to keep the federal government running through September. NASA’s budget accounts have been cut a total of $896 million and whether the above mentioned Full-Year Continuing Appropriations Act of 2013 (H.R. 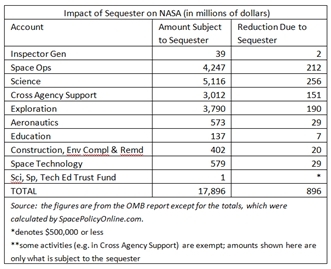 933) would become law, NASA would reabsorb the 5% budget cut displayed below in the table, courtesy of SpacePolicyOnline. Because of the heavy cuts, NASA might lose some abilities to manage test facilities and support the related R&D efforts, leading to cancellations of ongoing partnerships. Sequestration will result in NASA canceling 6 technology development projects, delaying an additional 9 projects, cancelling several flight demonstration projects, eliminating or de-scoping annual solicitations for Space Technology Research Grants (STRG), NASA Innovative Advanced Concept (NIAC), and the Small Spacecraft Technology (SST) Program. Aeronautics will reduce its budget by $7.3 million below the FY 2013 budget request, cutting funding for facilities maintenance and support; air traffic management concept development; systems analysis conducted with the Joint Planning and Development Office; research into safety for vehicle and systems technologies; and research into civil tilt-rotor technologies. It will entail diminishing NASA ability to develop technologies necessary to enable next generation air traffic management and to ensure needed safety levels. The Aerospace Industries Association began warning of dire consequences of sequestration last December (Credits: AIA). 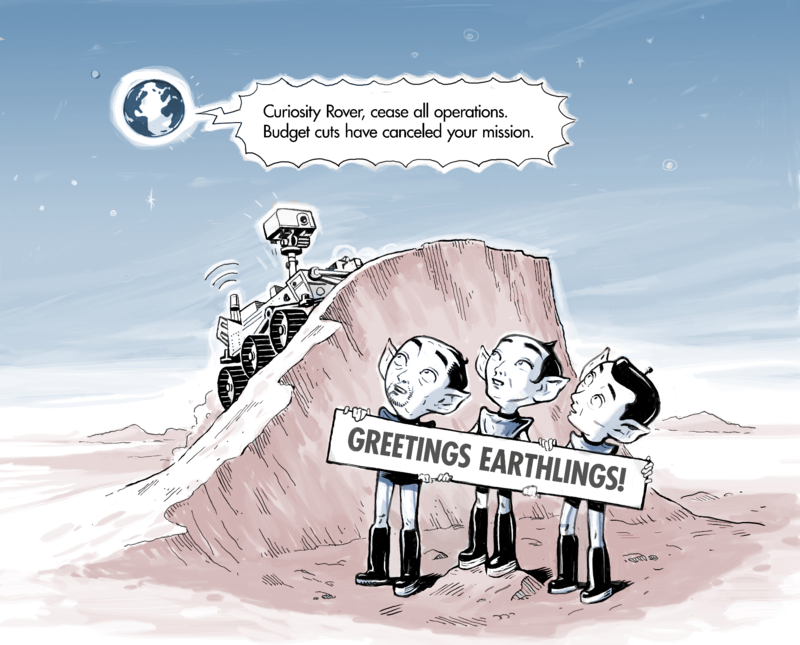 Furthermore, NASA Science program is to be reduced $51.1 million below the FY 2013 budget request, affecting new Explorer and Earth Venture Class mission selections, reducing their funds from 10 to 15%, lowering funds for new activities and causing minor launch delays, as well as reducing funds allocated for competed research projects by about 2%, cutting 5% in support jobs at universities, businesses, and other research entities around the nation. Overall availability of commercial crew transportation services are expected to be significantly delayed, thereby extending US reliance on Russia for crew transportation to the International Space Station. Space Launch System will actual see increased funds over their 2012 levels, moving $381.2 billion from NASA Space Operations and Cross Agency Support accounts, into the Exploration account. Commercial Crew Integrated Capability (CCiCap) will not achieve the foreseen milestones for the last quarter of 2013, due to sequestration cuts. Space Technology has been reduced by $149.4 million below the FY 2013 budget request, risking losing several ongoing projects as they require increased funding in FY 2013 to proceed. The sequester process has reduced Exploration Research and Development funding by $45.5 million below the FY 2013 budget request, delaying Advanced Exploration Systems procurement of critical capabilities required for the next phase of Human Space Exploration. No funds will be allocated for Programmatic CoF, cancelling many institutional construction projects for critical infrastructure, required to repair NASA’s rapidly deteriorating infrastructure in order to protect NASA employees and meet Mission requirements. The following locations are exposed to projects cancellations: Glenn Research Center, Goddard Space Flight Center/ Wallops Flight Facility, Jet Propulsion Laboratory, Johnson Space Center, Kennedy Space Center, Langley Research Center, Marshall Space Flight Center. Sequestration will also affect NOAA’s Budget as Dr. Fuller explained in his report, cutting around 2,500 jobs on the weather satellites specialized workforce that has no equivalent in the public or private sectors, negatively affecting “the quality of weather forecasts in the near term.” Moreover, NOAA has been exposed during the lasts years to continuous budget cuts and the deprivation of $154 million from the developmental budget to replace polar weather satellites will not improve the situation. Polar-orbiting satellites continuously scan the planet from north to south. Instruments aboard these satellites are used for many applications in addition to weather forecasting. To cover the US emerging gap in earth observation ability NASA launched the Suomi National Polar-Orbiting Partnership (Suomi NPP) in 2011, until the next polar satellites generation, Joint Polar Satellite System (JPSS), will be operative. Recent budget cuts will probably delay the program, expected to be fully functional early 2017, by a year or two. “Nearly a half trillion dollars of the U.S. gross domestic product was impacted by weather variability,” in 2012 says Dr. Fuller, an impact that could grow with decreased forecasting accuracy.